In this study, we investigate spatial differences in thermal comfort conditions using the net effective temperature (NET) considering the synthetic effects of air temperature, relative humidity, and wind speed. 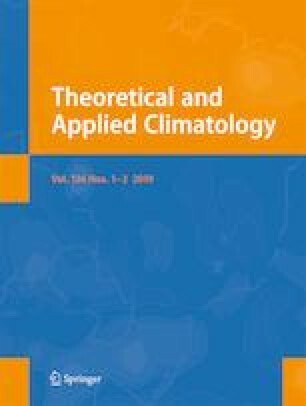 Using a daily-scale dataset of maximum air temperature (Tmax), relative humidity, and wind speed from 518 stations during 1960–2016 across China, we analyze the influence of different climate conditions on NET or Tmax at three different levels of hot conditions (35 °C < Tmax < 37 °C, NETTmax35 for HT35 cases; 37 °C < Tmax < 40 °C, NETTmax37 for HT37 cases; NET = 27 °C, NET27 cases). In HT35 (HT37) cases, NETTmax35 (NETTmax37) can reach up to 32 °C (34 °C) in southern China and also can be less than 29 °C (31 °C) in western Northwest China. In NET27 cases as the threshold for the thermal sensation of very hot, Tmax should be over 33 °C in western Northwest China and was less than 30.5 °C in southern China, by contrast. With global warming, there is an increasing trend in the number of extreme hot days in most part of China, but a decreasing trend is detected in the part of Jianghuai region, partly due to the decreasing trend in Tmax. We wish to thank the editors and three reviewers for their invaluable comments and constructive suggestions to improve the quality of the manuscript. This work is financially supported by Hainan Provincial Natural Science Foundation of China (SQ2019QNJJ0030) and Geography of Key Disciplines in Hainan Province (2017CXTD006).